We recommend using the "custom" install option instead of "standard". Custom install lets you choose components, like before, whereas standard defaults to "all" on clean installs, or "previous" on upgrades. lol, somebody forgot to update the installer window text. The 58 beta version does not support multilanguage profile. So, this feature can be avariable soon or in the closed beta of Winamp 6.x. A possibility to attach FFMPEG/Libav codecs for Windows XP? Exist a possibilty to use the FFMPEG and/or Libav codecs for H.264/X.264 and/or many others for Windows XP SP3 usage? it should be noted you will lose any milkdrop 2 presets / sprites when you update if you dont back them up first .. just found out the hard way ..
Update: The crash has apparently to do with alphabackground xml-tag in my skin, which creates a transparent background in the "About" window. This is confusing. Here it's said that a few features are work-in-progress. On the main page it says that this is not an ongoing project. This version is not an ongoing project but be sure that we are currently working hard on a future new Winamp. What's happening with 5.8 now? I for one won't be installing Winamp again that ship has sailed here as I suspect it will have done for other users. No lang packs in this build. It's been changed for the next build. There might be e.g. a 5.81 and further updates. It will install on XP, but as you've found, it requires Vista or newer for Windows Media Foundation based codec support such as AAC & MP4 (MPEG-4 part 2, H.264, etc) and also the native Windows api for CD playback. For AAC, you'd need to replace in_mp3.dll with the version from 5.666, plus old system\aacdec.w5s decoder, and also remove in_avi.dll, in_mp4.dll & in_mkv.dll and add AVI;MP4;MKV (etc) to in_dshow config instead. Which skin? Is there anything we can do to prevent that? Or is it something skinners will need to address? Please explain further. I couldn't reproduce the milkdrop issue with the installer. If confronted with "Windows protected your PC" dialog on Win10 (see attached screenshot), this will be due to our new digital signing certificate which won't yet have been recognized in the internal MS database. Note where it says "prevented an unrecognized app from running". and it will be due to the new cert (possibly in combination with the filename). It is safe to click "Run anyway". No playlist generator plugin shipped with this one? Is this because that plugin stopped working in older versions and wouldn't also work in 5.8? Hi, just installed. Almost everything works for me. Except one problem with wasapi: everytime there is a music break (next song, stop and play, ..) the windows sound volume is set to 0 and inside Winamp I have to change volume a bit to set this back. My audio problem of jittering/crackling still persists with this version. I am waiting for a moderator to post my thread about this issue. Which skin? Is there anything we can do to prevent that? Or is it something skinners will need to address?. Hello DJ Egg and thanks for the update. I just ran some tests with recent development files from my skin (see screenshot) and must admit that the culprit was hiding somewhere else. And within the script for that particular component I found a bug, which never made problems while running the skin. I just put a setDelay(); within a timer and hitting the OPTIMIZE button caused that whole mayhem. So we're good now. Last edited by PeterK. ; 19th October 2018 at 15:39. Do all or most of the 3rd party addons/skins still work? Just one Question!... skins still work? May I share some improvements tips with the developer team from the "skinner-point-of-view" and if yes where should I post them? 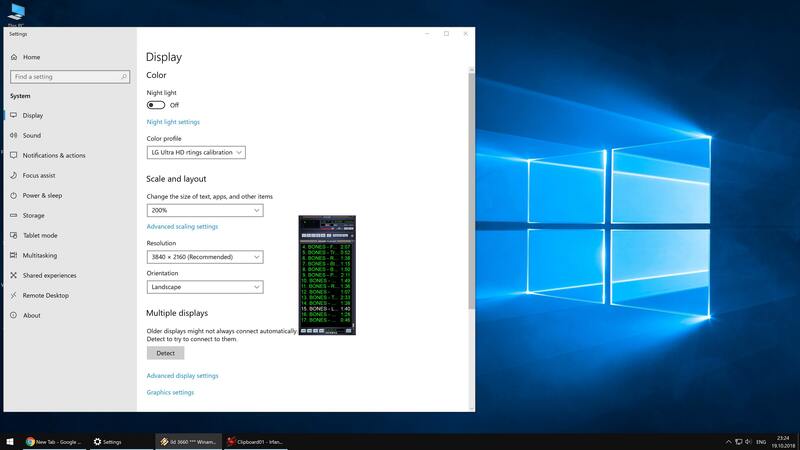 Windows 10 scaling does not work. Go to Options->Double Size. This is the only help here. Classic skin has a fixed size, which do not "respond" to Windows' scaling factor. The other idea would be to get a Modern Skin and apply Winamp's scaling option. Great news! Checked, works fine! Great to see Winamp back, we loyal users never gave up. Look forward to 5.81 or the official 5.80 if there is going to be one. The option for Windows Media Foundation is nice but thankfully ffdshow still works, there's far more options with that and changing basics like like aspect ratio and cropping is limited with Windows Media Foundation so please don't consider removing the in_dshow.dll plugin if XP support ends. The release of Winamp v5.8 Beta suggests that Radionomy finally found a suitable lead developer. And it took only 4 years! There is a new lead developer, right? How else could a new version be released? Who is the new lead developer for the desktop Winamp? Will the desktop development team participate in this forum regarding bugs, wishes or suggestions? Last edited by ryerman; 20th October 2018 at 04:01. This is great news, ty you for keep on keepin on! WOOOOOOOOOOOOW THIS IS AMAZING!! Thanks for keeping it alive. Been using winamp since it first came out and it's a part of me. All Gracenote components were removed (cddb, playlist generator, etc.). All "Licensed to AOL" 3rd-party components/services/features were removed (Gracenote, Sonic, Fraunhofer, etc.). which was one of the reasons why we didn't release 5.8 sooner (i.e. because it was missing features from 5.666). imo, CD burning should be a low, if not very low priority. autotagging, cover art, audio fingerprinting should prob be the top priority. after that, R128 RG, and once i have collected more info i'll have another good suggestion. its unclear tho, is Benski back? officially? unofficially? what? Would it be possible in a future release to add an option to turn the playlist search box off? Other than that, as an old user since the early 2000s, it's looking good! i haven't checked the options to see if that or this is possible, but i would like that and an option to move it to the bottom of the playlist, and/or bottom of the playlist, but above the artwork. It depends how many developers are interested and will be willing to read this stuff. If you are the only one, I could send you PMs or mail. On the other side I would like other fellow skinners to join me and to share their experience. In this case a new thread called "Improvements tips for 5.8+" would be the best location. Why did you provide a link to a post by Benski: "Former Winamp Developer"? Are you saying that Ben Allison is now the lead developer for Winamp's desktop version? Maybe you know that the conflict-of-interest he mentions has been resolved so that working as a part-time developer for Vivendi is now acceptable? I don't understand the relevance of the link you provided. If you want to answer my previous questions, please be explicit. Have used Winamp beta today on the local radio station as playout system and it worked like a charme. not one issue detected while running it on a 3 hour radio show. the fade out and fade in went smooth. now downloading it on my home computer. Streaming radio also down. Usually that would use up 30mbs or more but currently only 7.3mbs after an hour so good job fixing memory leaks.